Is Iran's Regime About to Fall? 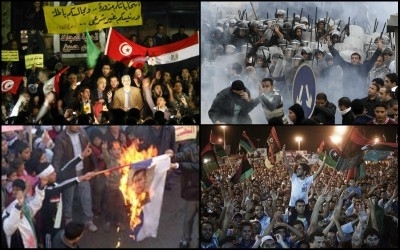 In 2011, popular uprisings overturned the rule of deeply entrenched regimes in (clockwise from top left) in Tunisia, Egypt, Libya, and most of Syria. Why not Iran? The Islamic Republic of Iran is convulsing again. The largest anti-government protests since the Green Movement erupted in 2009 began last month in the city of Mashhad and spread throughout the country, with demonstrators chanting "death to the dictator," "death to Hezbollah," and "death to the Islamic Republic." Iranian security forces deployed both violence and street theater to retaliate, killing more than twenty people and imprisoning hundreds of others, and ginning up massive pro-government demonstrations of their own. Revolutionary Guard Corps commander Mohammad Ali Jafari now declares that the "forces of sedition" have been defeated. We'll see about that. The cities could boil all over again as soon as tomorrow. Iran's citizens aren't suddenly happy with the status quo. They are simply cowed for the moment or taking a breather. And these demonstrations are different than those of the recent past. They didn't start in the relatively liberal and cosmopolitan northern part of Tehran, where hatred for the repressive government perpetually simmers, but instead in what was recently considered a clerical stronghold. 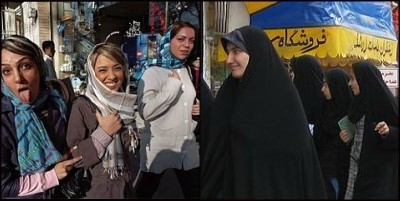 The unrest started not in relatively liberal and cosmopolitan Tehran (left), but in the conservative stronghold of Mashhad (right). After the relatively recent toppling of five authoritarian Arab regimes—in Tunisia, Egypt, Libya, Yemen, and then yet another in Egypt—it's only natural to wonder if this is the beginning of the end of Iran's Islamic Republic. No tyrannical state lasts forever. With just a handful of exceptions, all of them monarchies, the only governments in the entire world that have lasted a century or longer are democratic. All others are transient, and they're transient for two basic reasons. They lack the long-term legitimacy and flexibility that all governments need to navigate inevitable changes in culture and history. Democratic governments can turn corners—sometimes to the left, other times to the right—while rigid autocratic systems almost always calcify in place as the people beneath them move on. Pressure slowly builds over time as if two tectonic plates are in a slow-motion collision until an earthquake finally pulls everything down. That's what happened during the Iranian Revolution in 1979 and it will surely happen again, even as the current regime withstands smaller tremors between the two big ones. 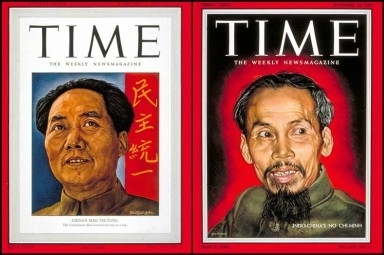 Mao Zedong (left) and Ho Chi Minh. Occasionally, dictatorships survive by reforming themselves out of all recognition and undergoing a regime-change in all but name. That's what happened in Communist China and Communist Vietnam after Mao Zedong and Ho Chi Minh died. Usually, though, autocracies fall when they collapse internally or are overthrown in a revolution or war. Sometimes they effectively give up and lose the will to do what's necessary to hold onto power, as in the former Soviet Union. Other times, the armed forces turn against the palace, as in Nicolae Ceausescu's Romania and in Egypt more recently (twice). Still others, like Iraq's Saddam Hussein and Cambodia's Pol Pot, are removed by conquering armies. Some, like Libya's Moammar Qaddafi, are toppled by armed insurrections. Once in a while, despots flee in the night to exile abroad, like Ukraine's Viktor Yanukovych and Tunisia's Zine el Abidine Ben Ali. The real question, then, isn't whether or not Iran's government is about to fall. The question is, does Iran's regime appear poised to suffer one of the more specific fates listed above? It's spectacularly unlikely that those at the top of the pyramid, along with their Revolutionary Guard Corps, will lose their nerve and allow themselves to be peacefully overthrown by civilians. "Supreme Leader" Ayatollah Khamenei is no Mikhail Gorbachev. That's for damn sure. They will fight back. They're doing it now. And those at the top of Iran's clerical system are spectacularly unlikely to ever run away like Yanukovych, who lives today just outside Moscow. Where would they run to? Syria? That doesn't even pass the laugh test. Russia's Vladimir Putin may be their ally, but these people aren't going to live out their days in the frozen north under lifelong surveillance among godless atheists and Orthodox Christians. It's spectacularly unlikely that those at the top of the regime pyramid will lose their nerve and allow themselves to be peacefully overthrown by civilians. The Iranian army could turn against the ayatollahs as Romania's did when it arrested and executed Ceausescu, but that's what the Revolutionary Guard Corps is for, to protect the regime from the regular army which is as ideologically heterodox as the country itself. And there's virtually no chance that any country is going to invade Iran and demolish the government. Americans have no appetite for another regime-change adventure abroad, especially not in the Middle East, and no other country in the world is willing and capable either. Iran's government, then, is likely to survive for the foreseeable future. Eventually, though, it will fall, as all such regimes finally do in the long run, and what will most likely herald its eventual downfall is a combination of Soviet-style loosening and rot from within. The Soviet Union lasted seven decades before that finally happened while Iran's Islamic Republic hasn't quite been around yet for four. And the Russians suffered an empire-shattering loss in Afghanistan before softening up under Gorbachev. Iran's regime is likely to survive for the foreseeable future. The Iranian government, meanwhile, is riding high on a string of partial victories abroad in Syria, Iraq, Lebanon, and Yemen. Outright losing in some of those places would weaken the government's confidence, as would enough morale-sapping demonstrations from the width and breadth of Iranian society, but that's not going to happen at a time when the government is still just popular enough to whip up large demonstrations on its behalf. The tipping point will likely come when those tasked with internal repression sympathize with the protesters and either stand down or turn outright against the regime. That's what we need to watch out for. There are no signs of either of those things happening now. That could change, and it could change in an instant, but Iran isn't there yet. Michael J. Totten is a contributing editor at The Tower, a Middle East Forum writing fellow, and the author of seven books, including Where the West Ends and Tower of the Sun.